It took the Great Fire (1666) to bring the first Fortnum to London. Due to the massive damage, William Fortnum was able to establish himself as a builder in the East End, where for us his story ends. In 1705 his cousin, another William arrived and took lodgings with Hugh Mason who ran a small stall in St James Market. ROYALS CAN'T HOLD A CANDLE TO FORTNUMS! In 1707 cousin William became a footman in Queen Anne's Household creating a royal connection unbroken to the present day. Protocol dictated that the Royal Family could only burn candles once (but of course) and one of William's perks was to get the used ones. He became a candle-seller and grocer in his spare time, persuading landlord Hugh to join him as partner in a shop. This illustration shows the store in the 1700s. Off Duke Street near Piccadilly, Mason's Stables in Mason's Yard were once owned by Hugh. 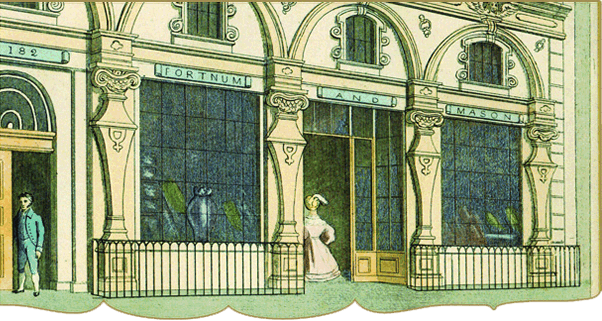 Some Fortnums were in the East India Company (1600-1874) which sold teas, spices and many gourmet items to the store. By about the fourth generation Fortnum & Mason was no longer owned by the families although some probably still worked there. Napoleon said this and it is probably quoted as often as his "Britain is a Nation of Shopkeepers" remark! Did he realise that Fortnum's was shipping supplies to the Duke of Wellington and other officers during the Napoleonic Wars (1799-1815). Handsomely packaged Fortnum preserves, dating from this time, were advertised in The Times. 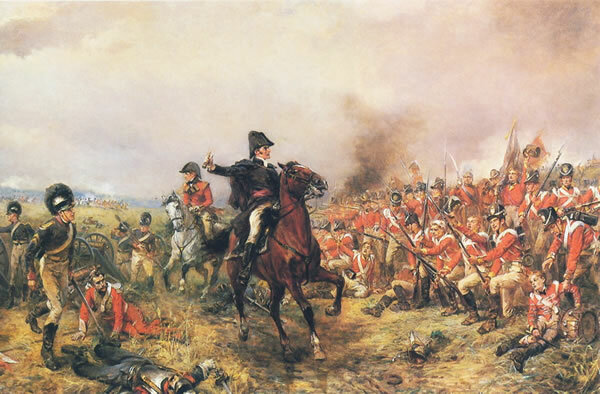 Below Wellington is victorious at Waterloo, a one-day battle that ended these Wars in 1815. As a result Napoleon Bonaparte was exiled on the remote island of St Helena. The home market also expanded with the growth of aristocratic houses and London clubs in the St James area during 1810-1850. Roundsmen visited Royal and other residences but the shop was always crowded too. We think of fast food as a modern invention, but by the time of Prince Albert's Great Exhibition in 1851 ready-to-eat dishes were all the rage! Fortnum & Mason, by now a household name, supplied all Queen Victoria's Jubilees and other vast projects, as well as sporting events. The University Boat Race, horse racing at Ascot and The Derby, Henley Regatta, yachting at Cowes, shooting parties - wherever there was a demand for gracious living in the open air Fortnum's provided their world renowned hampers. The novelist Charles Dickens, a regular customer, wrote of Derby Day, "Look where I will.... I see Fortnum & Mason. And new heavens! All the hampers fly wide open and the green downs burst into a blossom of lobster salad!" Dickens rewarded himself with a hamper whenever he finished a novel. When the scandalous hospital conditions of the Crimean War (1853-56) became known, Queen Victoria ordered a huge consignment of concentrated beef tea to be sent from Fortnum's to Florence Nightingale. Thousands of gallons were shipped in flasks and heated up on site. Company archives show that Florence herself settled the accounts. 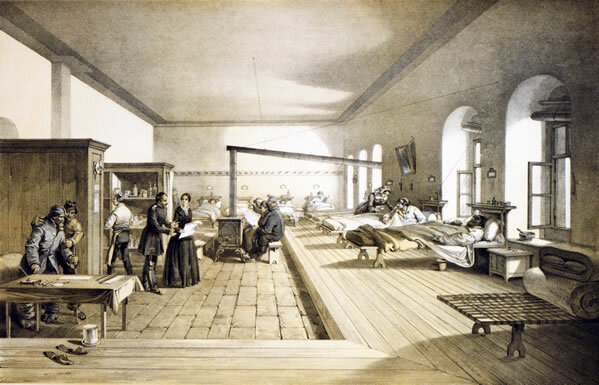 The lithograph below shows Florence in a ward at Scutari Hospital in 1856. In 1886, a young man called Mr Heinz came from America with his new development of canned food. Fortnum's immediately took all five cases and ended up popularising the brand. Today Heinz sells to the mass market and is no longer considered a luxury. The British Empire, at its zenith in 1918, embraced over a quarter of the world's population and land surface. (Modern colonisers eat your heart out!) And yes, you've guessed it, Fortnum's was filling bellies in far-flung outposts! From 1908 a new department provided kit for global expeditions, safaris and cruises. In the social whirl of the Edwardian era (1901-1910) and beyond, Fortnum's offered a complete service including table decorations, chefs, butlers and footmen. The store continued to grow, was rebuilt in the 1920s and refurbished several times since. A CLOCK TAKES THE BISCUIT! 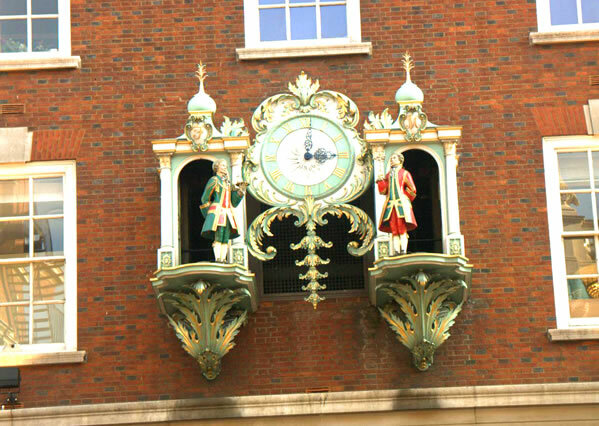 In 1964 Piccadilly acquired a new landmark, the famous Fortnum & Mason clock - three years in the making, including structural work to support the 4.3 tonne weight. No other clock of similar magnitude had been made in the UK since Big Ben in 1861. As the clock chimes the hour, its front doors open and figures of the original Mr Fortnum and Mr Mason move forward, turn to each other and bow. After the chime, a range of 18th Century airs play on eightteen bells. As the tune ends the two figures bow again and return to their respective pavilions. So if you are ever visiting Piccadilly don't forget to stop at 181 on the hour! After the first moon landing in 1969, an astronaut's wife visiting Fortnum's was told of the shop's interest in the enterprise. If the moon really was made of green cheese, there was only one place it could possibly be sold! 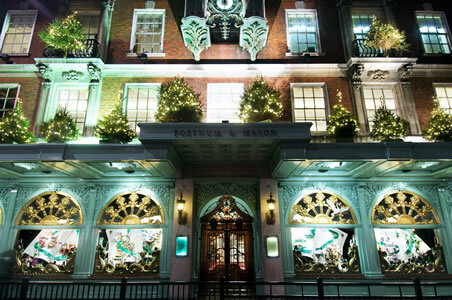 Fortnum's continues to anticipate new trends with a wide range of designer goods and services. It was one of the earliest to sell televisions. Today the offerings include aromatherapy. Passengers can buy Fortnum's most popular delicacies at Heathrow and provincial airports. And the Fortnum's website was a first for a London store. "As we prepare to become that rarest of things, a 300-year old business, the pulse of the entire enterprise is quickening. The refurbishment to 181 Piccadilly will bring an invigorating sense of space and openness to echo the spirit of enlightenment that prevailed at our foundation. The timeless thrill of walking into the ground floor will be as potent as ever, but a new central lightwell will allow everyone to realise just how much more there is to Fortnum’s than a magnificent Food Hall. Soon new restaurants and departments will appear alongside the refreshed originals while the Food Hall itself will spread over two floors and include a wine bar. Already the dust-proof hoardings are in place, meaning we can perform this sensitive open-heart surgery without ever closing during business hours. All works will be completed in time for our unique tercentenary in October 2007." Works are completed and the new two-storey Food Hall is open. 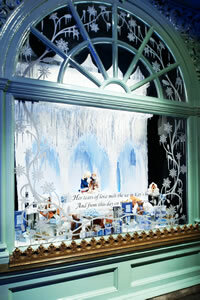 For many years now Fortnum's has become particularly famous for its Christmas windows which are themed and very detailed. It seemed fitting to show some examples. On the left are four of twelve windows from The Twelve Days of Christmas song in a fabulous, brightly-lit noctural view of the store. Far right, another year, another story shows Kay and Gerda from Fortnum's Snow Queen tableaux. Photos by Andrew Meredith in 2005 and 2008 from Wikipedia Commons under CC BY-SA 3.0 license.